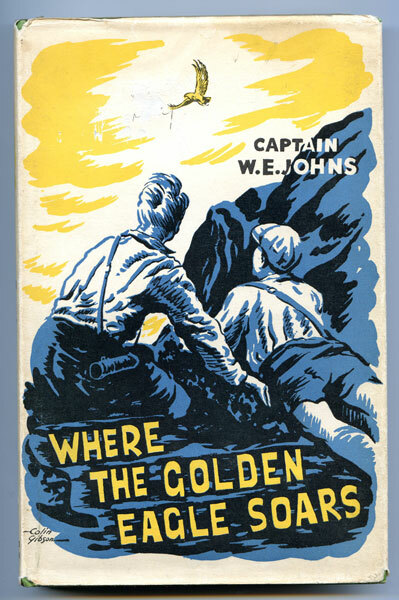 Here is a Hodder and Stoughton 1st edition 1960 of 'Where The Golden Eagle Soars' by Captain W.E.Johns, most notable for his Biggles books. He describes it as 'A story for lovers of nature about wild life in the Highlands of Scotland'. Johns lived in Scotland 1944-1953 and his intimate knowledge of the hills, lochs and glens enabled him to give an excellent picture of life in a remote part of the Highlands of Scotland and warnings of the dangers. This is a Hard Back in bright green cloth with gilt titles and vignette on the front of an eagle and mountain. The fabulous dust wrapper is by Colin Gibson and throughout the book there are 32 small wood engravings also by him. A fantastic book and in good condition. CONDITION: Clean clear pages and bright clean boards. Dust jacket not price clipped. (12s 6d). As you can see from the photograph, the dust jacket is in very good condition with tiny tears at the top and bottom of the spine and front bottom corner. However there is a small area approximately 2x2cm of surface scuffing to the dust wrapper on the front near the eagle. It is not particularly noticeable but you can feel it.